This photo was taken on Saturday June 9, 2018 at 9:47 AM. The location was in the street near a large hotel in the City Center District in Washington DC. The "Take It!" was an almost immediate decision. 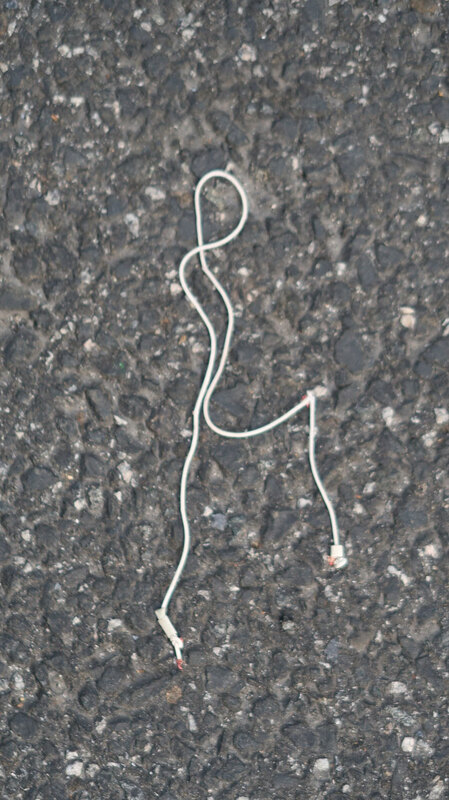 I had just gotten out of my car and walked a few paces on my way to reaching the sidewalk when this small bit of dropped cable came into view. The configuration of the cable gave it a stick figure like appearance. The motion of the figure that came to mind was one with arms at the sides, high stepping, which most of us have seen at one time or another as a part of a performance. I cannot recall seeing it done as a spontaneous move, done in the view of the general public. The After Take: I showed this photo to a number of people on the same day that I took it, and all joined me in the wonder of the catch. I could not help but highlight the marvel of the contrast in color of the cable to the canvas provided by the asphalt background. All agreed that the match up was a great one. Yet another "treat” found in the street. PS: I sometimes think the "share" is as good, if not better, than the "find.” It takes one, to have the other. That cable has definitely seen some better days. I wonder if it was broken before or after someone threw it away. Looks like it’s doing hurdles lol. Man those things are expensive, I’d be annoyed if mine ended up in that condition. Lol I can see it, fitting title!